There's a night I'll always remember: I was with a couple of friends at St Pancras Station in London and we were dancing down the street singing "Cool Rider," as you do. It was late and we'd had a bottle of wine, okay? A group of people walked past and one of them gave us a knowing wink. There was an unspoken connection. 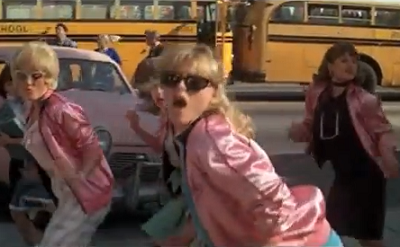 She, too, was part of the Grease 2 cult. I am reminded of the existence of a Grease 2 cult every now and then when the movie is mentioned at, say, a house party and about 1-3 people start enthusiastically singing one of the songs. 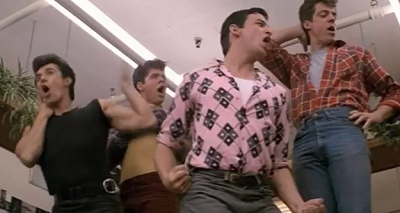 Grease 2 is a marmite film--you either love it or you hate it--and its cult following is exclusive. You can't join it later in life. It's not that we don't want new members--in fact, we'd love to have them on board--it's just that I'm pretty certain they wouldn't like the film. 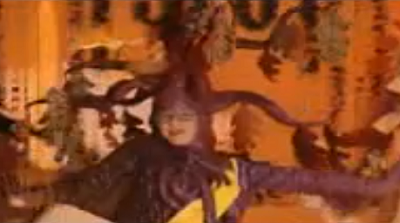 The people who love it (and know all the songs) seem to have first watched it through the uncritical eyes of a kid. Here's a word of advice to these people: it is no use trying to convert someone to the Grease 2 cult. You would have to turn back the proverbial hands of time to pull that off. See what I did there? There are a lot of us Grease 2 cult members out there, mind you. 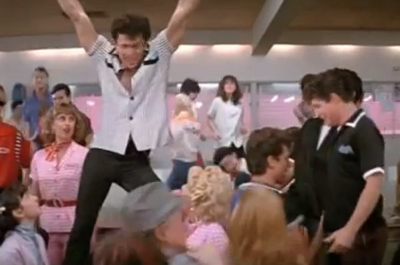 Just ask the creator of Grease 2's Facebook fan page as it's got over 17,000 likes! That's no mean feat, considering I've only got 66 for my Beverly Hills 90210 fashion page Now Wear This. (Yes, that was a shameless plug). This song has an extremely filthy vibe and that's why kids loved to sing it. What's more, we were just as clueless about the subject matter as the T-Birds. I recall that, in about year 3, my friends and I-- thinking we were being smart and naughty--asked our teacher to put "mentalstration" on our next spelling test. She looked at us, aghast, then said if we could find that word in the dictionary, it could be on our next spelling test. Touché, Ms. Van-Dyken. Touché. We all wanted to be Michelle Pfeiffer, and I'm sure that there were many a straight boy and gay girl who wanted to be with Michelle Pfeiffer. She was the prettiest and most popular girl in school, a fact she made known during the film's opening number when she led the chant explaining the Pink Ladies pledge "to act cool, to look cool, and to be cool." Wearing pink every day to be cool was really only something that 10-12 year olds could do. Or purple if you were more into Sweet Valley Twins and wanted to be a unicorn. We all felt like bad asses when we sang this (see point 1), not to mention that it's a pretty damn amazing song. Why? Do I have to spell it out? Okay, I will. C-O-O-L R-I-D-E-R.
Talk about dreamy. And non-threatening. Hey, he befriends Delores Rebchuck and is more of a loser than her. In other words, he was the perfect non-threatening lead actor to appeal to 12 year old girls. This goes back to point 2: girls love to be part of groups that are exclusive and to categorize themselves within that group. This is one of the reasons why the Spice Girls were so popular. It was always a race to see who could be Stephanie, Sharon and Paulette, and the loser got to be Fall tree Rhonda. Was that the way it went down in other groups? I'd love to know! 6. Popularity and Fantasy FulfillmentWhen we were kids, we couldn't see the bad message this movie carried, that it's important to conform and gain the acceptance of the peers who mock you. Then again, Grease also carried this message, so there! Most kids wanted to be part of the popular crowd and this movie glorified it. Michael got there in the end when he became a T-Bird and got the girl. Cue wearing pink (or purple) every day to school. Who didn't want to own this and the star head decoration? Then there's her reversible "Cool Rider" jacket. That I still want.